Villa Cimbrone Gardens, Ravello.Hilltop Ravello, 6km (3.6 miles) from Amalfi town and 1,155 feet up in the hills, is a sweet-scented landscape bursting with color. It's a tiny town of profusely flowering vines and shrubs where discreet hotels share space with everyday houses, tumbled-down buildings planted with vegetable gardens, and crumbling villas whose grounds and lush pleasure gardens have become public parks. Almost every bend in the stony alleys and stairs opens upon a new eye-popping vista to the distant eastern stretch of the Amalfi Coast, or down into the Valle del Dragone (Valley of the Dragon) dropping below the western edge of town, a deep vale of green terraced with gardens and strewn with white houses and small hamlets. The Valle del Dragone, Ravello.Ravello and its excellent restaurants, lovely villas, and summertiem outdoor concerts make a marvelous escape from the tourist crush of the sun-worshipping towns down on the coast, and has long been a favorite with writers and musicians looking for a quiet retreat. 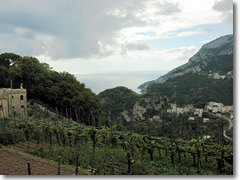 Gore Vidal long maintained a villa up here, and D. H. Lawrence and Greta Garbo both spent time unwinding in Ravello, a lofty Garden of Eden along the already enchanting Amalfi Coast. 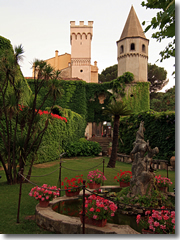 The Ravello tourist office is at Via Roma 18bis, just up the street to the left of the cathedral.